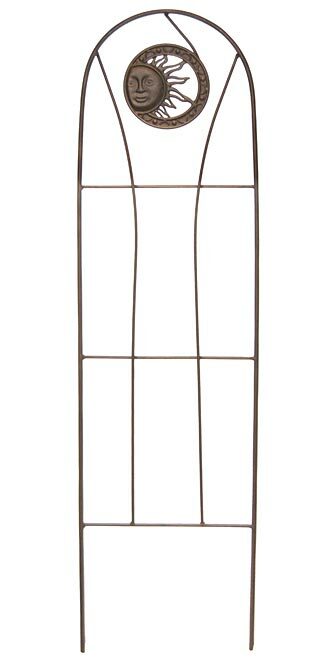 Place a brilliant plant support in your garden with the American GardenWorks Bronze Sun Pot Trellis. Using a trellis in your landscaping provides climbing plants upward support, and this one will certainly bring a shining bit of style to your area. The robust, all steel construction forms a hardy unit, while the sun medallion near the top captures interest. Open rays emanate from the sun's face, and a detailed band around the art evokes other heavenly bodies. A powder coating in a mottled, bronze hue not only keeps the item protected from the weather, it also shines a bit in sunlight for added excitement. Horizontal rods, intersected by slightly arched, vertical rods, lend structure to the unit, and also offer your plants places to grip as they grow. Insert the two, 9.25" long legs into your landscaping, or place the item inside a 14" diameter or larger pot for an indoor plant support. Enjoy a hint of sunshine in your garden all year with this Bronze Sun Pot Trellis. Made in the USA.